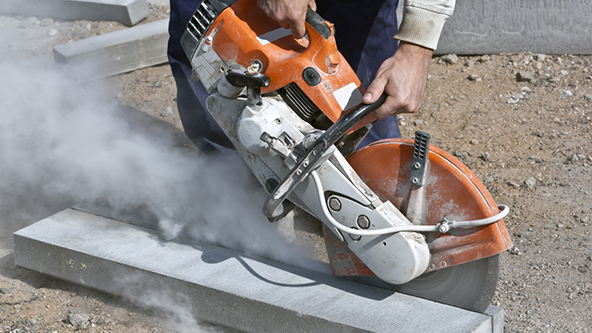 The new OSHA rule governing respirable crystalline silica calls for medical surveillance screenings to allow for identification of silica exposure-related health effects in certain workers. But who exactly must be surveilled? How? When? This guide will try to pin down the precise requirements as OSHA has articulated them in the new rule. Who needs medical surveillance under the new rule? So an employee of mine qualifies for medical surveillance. What does that even mean? The employee may learn other medical information from his or her physician during the visit, but this is private and not required to be shared with the employer (or anyone else). What exactly must the physician’s exam involve? Some physicians specialize in examining patients for ailments related to exposure to silica dust. OSHA does not require it, but you may find it more efficient to proactively seek out these practitioners in your community. Do I need to give the heathcare provider anything? The new rule does not express a preferences for whether this information be sent directly from the employer to the medical professional, or sent along with the employee. What if I know in advance, without tracking days, that an employee is definitely going to qualify for medical surveillance? You must also make subsequent medical exams available “at least every three years” and more frequently if that’s recommended by the healthcare provider. When does this medical surveillance requirement take effect? Does OSHA realize how much this will cost me? Yes. In the new rule, OSHA places the employer cost of each medical surveillance physician visit (including lost productivity time) at around $420. Can I pass that cost on to my employees? What if the medical professional conducting a medical surveillance needs to send the employee to a specialist to confirm certain findings? This must also be made available at no cost to the employee, and provided within 30 days of the initial referral. What if I am a staffing agency and my workers are sometimes assigned to jobs where they accrue exposure(s) that qualifies toward the 30 day threshold? It is our opinion — though OSHA does not state this specifically — that this strongly suggests OSHA would like to see staffing agencies taking on the responsibility of tracking which of their workers have accrued days of work in conditions with levels of respirable crystalline silica that qualify them in the direction of required medical surveillance. I have a lot of employees who might be exposed. Can I trust them to track themselves toward their 30 days per year threshold? This is a bit tricky. OSHA does not provide a proscribed system or method for tracking which employees have accrued days of exposure, but it does make clear that it is at all times the employer’s responsibility to track which employees are exposed. It seems likely that an OSHA inspector will want to see that you (the employer) have some kind of tracking system in place that involves more than employees self-monitoring. What if I hire a worker who has 29 days of exposure from a job he had earlier this year, with another company? Will he qualify for medical surveillance after just one day of exposure working for me? No. Progression toward the 30 day rule resets with every new employer. What if an employee has less than 30 days toward the threshold, but is obviously coughing and sputtering? Does this trigger medical surveillance? No. While it might be sensible to suggest this employee see a physician, OSHA does not require it. Explaining its rationale, OSHA says that it “did not include a symptom trigger because symptoms of silica-related lung diseases (e.g., cough, shortness of breath, and wheeze) are very common and non-specific,” and also because of employee privacy concerns. Is OSHA trying to assign blame for silicosis, and/or open me up to lawsuits? In the text of the rule, OSHA makes clear it understands that silica-related health problems can arise from a number of sources — including previous occupations/workplaces, or even “non-occupational” activities and hobbies. Is this medical surveillance requirement set in stone forever? Interestingly, it appears not. OSHA says that five years after implementation, it intends to “conduct a retrospective review” of the medical surveillance requirement and its subparts. Based on the findings of this review, OSHA may one day make changes or updates.